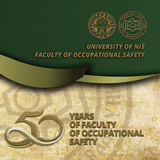 Faculty of Occupational Safety in Nis is a higher education institution with the status of a legal entity within the University of Niš. The Faculty is an educational and scientific institution. Within its basic or accredited activity, the Faculty organizes and implements academic and professional study programmes at all study levels, innovation of knowledge, and other forms of professional education and development. The Faculty conducts basic, applied and developmental research pertinent to its accredited activities. The Faculty performs other work for the purpose of the accredited activity, in compliance with the law and the Statute. The Faculty was founded by the Republic of Serbia. The Faculty has the status of a legal entity, with all the rights and obligations according to the law and the Statute. 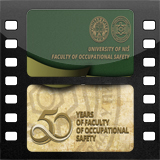 The full name of the Faculty is: University of Nis, Faculty of Occupational Safety in Niš. The Faculty location is in Niš, Čarnojevića 10a. The Faculty is registered with the Court Registry of the Commercial Court in Niš. The full name of the Faculty in Serbian is: Univerzitet u Nisu, Fakultet zaštite na radu u Nišu.